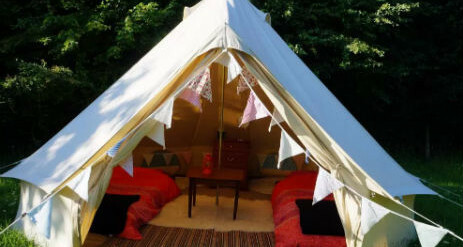 The Orchard Getaway is a glamping site in Worcestershire set amongst plum trees in the beautiful Vale of Evesham. The lovely market town of Evesham is nearby and the Cotswolds is just 10 minutes away. 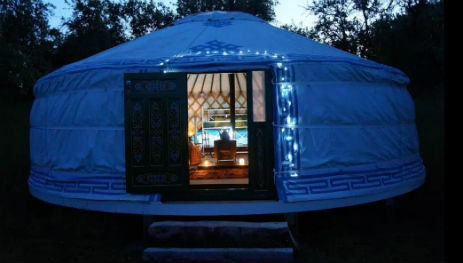 Our seven metre Mongolian yurt sits at the top of the orchard and sleeps four people in one double and two single beds with its own shower, composting toilet, outside kitchen and seating area. 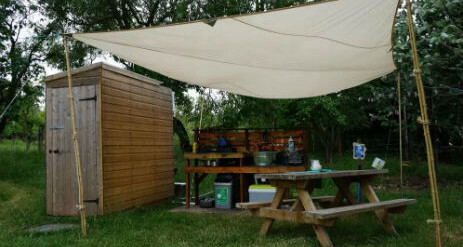 Further down the orchard we have three fully furnished bell tents with their own picnic tables and a shared mess tent with a social cooking and eating area. Other communal facilities include showers and compost toilets. There are several walking and cycle routes nearby including some long-distance paths such as the Cotswold Way and Wychavon Way. Ask us for advice on routes, or support if you’d like transport to or from particular sections of these paths. The Orchard Getaway is totally off grid so there is no electricity, but you’ll be provided with candles and solar or battery-powered lights. We also have books and games to borrow and to keep you entertained. 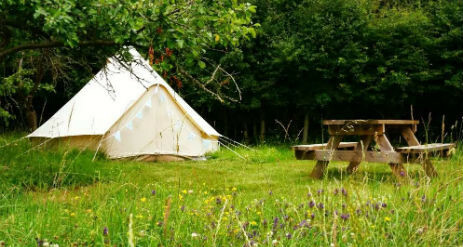 Campfires are permitted on site so gather round the crackling logs and admire the starry sky away from modern gadgetry. 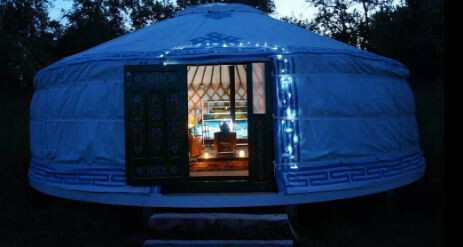 Open all year round, Burbank Yurt is located in a secluded area at the top of the plum orchard with beautiful views over to the Cotswolds, The yurt is felt insulated and has a wood burning stove to keep you cosy on cooler evenings. 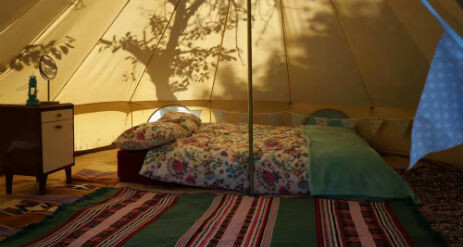 Our three fully furnished 4 metre bell tents are open from May to September. Victoria, Marjorie and Swan are all named after varieties of plum grown on the farm. 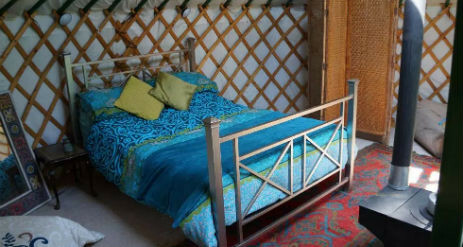 Each tent sleeps two on proper mattresses with bedding provided. Marjorie and Swan have double mattresses and Victoria has two singles. Air beds can be provided for up to two children or additional guests, just let us know when you book. Also included…. Towels, toiletries, torches, food, charcoal for the BBQ, some warm clothes and wellies and or walking boots. You will have the opportunity to buy some wonderful fresh local produce from our neighbouring market gardeners and have it delivered right to your accommodation door. We can email you a few days before you arrive to let you know what is in season and take your order. We are located in the beautiful Vale of Evesham, ideally situated to explore the North Cotswolds, Bredon Hill, the Malvern Hills and Stratford-upon-Avon. Closer still are the picturesque villages of Elmley Castle and Cropthorne that can be walked to on footpaths with a refreshment break at one of their pubs before the return leg. Attractions and activities nearby include…..
Stay for 4 nights Monday to Thursday and only pay for 3 nights . Discount automatically applied when booking.